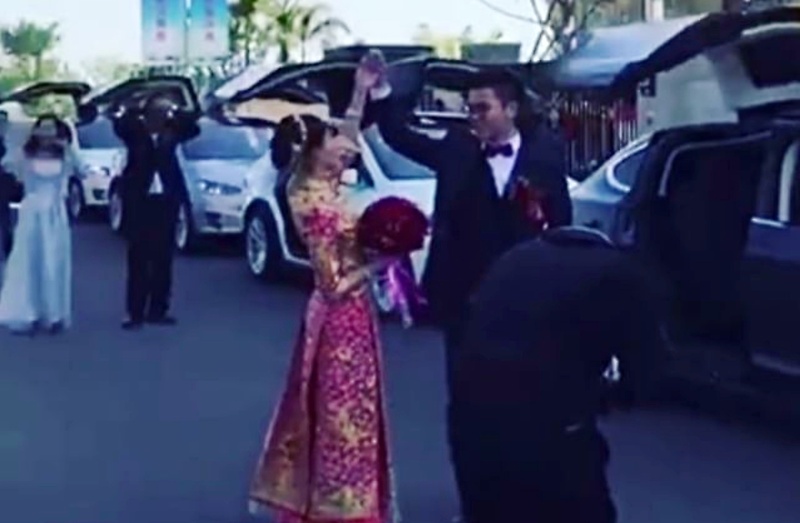 A video of a Tesla Model X fleet giving a synchronized performance for what seems to be a wedding in China recently started making the rounds online. As could be seen in the video, which was shared on a private Tesla Facebook group and the @TeslaMoments page in Instagram, the group of five Model X were lined up beside the newlyweds and their entourage. The electric SUVs were all in Celebration Mode, performing the ‘Holiday Show’ Easter Egg as their lights flashed and their Falcon Wing Doors ‘flapped’ in the air. The newlyweds and their entourage seemed to be enjoying the performance in the video, as could be seen by group smiling at the synchronized performance of the electric cars. Overall, just like the couple on our previous Tesla-themed wedding article last week, the newlyweds in the recent video seem to be huge fans of the Elon Musk-led company. Here’s the Model X fleet’s synchronized performance for your viewing pleasure. The Model X’s Celebration Mode is one of the electric SUV’s trademark features. Teased during a holiday performance back in 2015 and rolled out as an Easter Egg in 2016, the Model X’s Celebration Mode has become one of the most fun features of the electric SUV. This was highlighted by former Top Gear host Jeremy Clarkson in his recent review of the Model X. During the segment, the veteran host openly admitted that he loved the Model X Easter Egg, calling it an “absolutely necessary” feature. Earlier this month, Tesla CEO Elon Musk also teased a new, fun feature for the Model X. Responding to a Tesla owner who asked if his electric SUV can give birthday greetings, Musk stated that the company would roll out a feature that will allow the vehicle to play Marilyn Monroe’s cover of the Happy Birthday song. Just like Musk’s other Twitter-based ideas, the Marilyn Monroe Easter Egg sounds almost like a joke. If Musk’s record on Twitter is any indication, however, it would not be surprising if the Model X starts singing the birthday song to their owners and passengers soon. Apart from being a really fun vehicle, the Tesla Model X is also a very durable and powerful SUV. Just last week, Elon Musk shared a clip of what could only be the Model X’s most impressive feat of strength to date, pulling 250,000-pounds worth of dirt from a Boring Company tunnel. In that particular clip, the electric SUV seemed like it was having no trouble towing the 125-ton cargo. The electric SUV is also pretty durable. During Philadephia’s snowstorms early this March, a Model X parked in an office parking lot became the unfortunate victim of a falling tree. As could be seen in a clip of the accident, the tree’s trunk and branches came in contact with the electric SUV. Despite this, however, the Model X escaped from the incident completely unharmed.